Curved mouthpiece, with two hinges and slightly upward-curved center piece with a barrel. 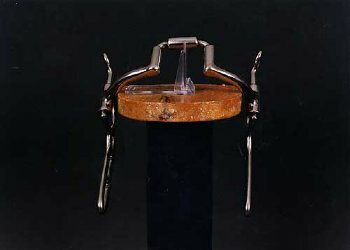 The Myler Correctional Ported Barrel mouthpiece allows the rider to isolate one side of the bit to life a shoulder and to reward the horse with a "comfort zone" when relaxed at the poll. It is a good bit for collection and stopping as well as for spoiled horses, horses that run through the bit, and those that drop a shoulder. Used in single and team driving. Also available with bushing.